Formatting Errors mean this page is not playing nicely in WordPress – feel free to view the original HTML page here, where all the images and links will behave. 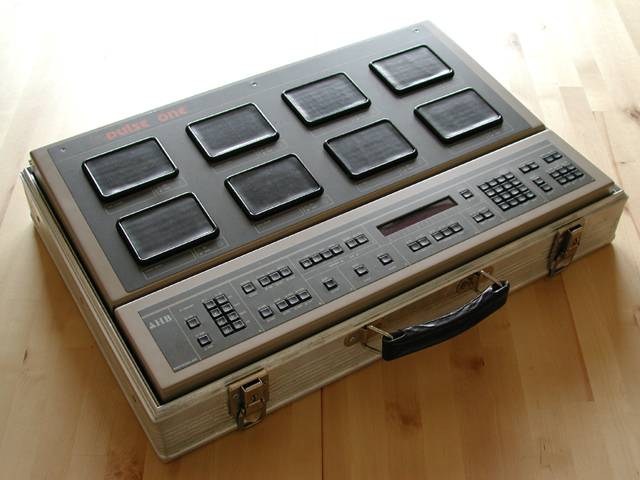 The Inpulse One is a surprisingly rare drum machine featuring 8 velocity sensitive pads, playable with hands or sticks, plus an insanely easy to use drum sequencer, crude MIDI, SMPTE timcode implementation and 256KB RAM. Sadly only 140 or less were made before production ended, and finding parts, extra sounds or information is next to impossible. The current page, with original brochure and user’s handbook can be found here. And their historic “Veterans” page is here – though their serial numbers are incorrect – they actually started at 1000-1089 with a further batch of “around 20” made following MIDI improvements, which were retrofitted to many of the older units. Since acquiring this some time ago, I’ve had contact with perhaps 3, maybe 4, owners and the designer – not one of the other owners I have spoken to has a working machine. In 2004 my retrozone article appeared in the August 2004 Sound On Sound. In has not been possible to correct some small errors in there, but they are corrected on this page and will continue to be as more information is gathered. The article is incorrect in that the Simon at Livingston Studios would have been Simon Bohanon, not Simon Jones (which could be a subconscious attempt by H2G2 to break out of my head in print). Since this page was originally created in 2004, a few new bits of information have come up. (quick plug: Robert’s got a book out – Banging On! Sounds were sampled for the Inpulse One using a combination of an Apple //e computer and an AMS DMX 15-80 – a studio grade delay unit with a fifteen bit sampling circuit. The memory of the AMS was read using a dummy memory card, by the Apple //e. Chances of me recreating this are slim, the AMS is still an expensive and rare device. “, now released on CD for the first time. He discusses it in an interview with Sound on Sound in 1986 and hints at the long gestation and time taken for the machine to reach the market. At some point in history, I found a reference on usenet or a forum somewhere that suggested Ed Vargo of T.H.D used one, though can’t contact or verify that. 1045 I am fairly sure I bought from Mark Jenkins, an electronic/prog music producer in the UK. None of my recordings have been released. Experience the Inpulse One’s Sound now! The Inpulse One is now approaching 30 years old and it remains overlooked. For owners of the Teenage Engineering OP-1, I have produced a couple of drumkits ready to use with the sounds I have currently. These are clean recordings from a working Inpulse One, and are ready to go – compare them to the kits available from other machines of the era! You can download the kits here, along with a list of instrument/sample names and keymapping. Please note: I do not own the copyright for any materials other than my own presentation and articles – the sound files and data are the original works of Allen & Heath or the team at Livingstone Studios and related consultants and suppliers to the Inpulse One. I have been given permission to redistribute these for the purposes of helping Inpulse One owners find new sounds, and keeping the history of this unusual drum computer alive. Whilst I’m sure no issues will arise of any fair use of these creations, do not copy and resell them in commercial sample libraries. Will we track you down? It’s unlikely, but I do regularly search for new information, forum posts and mentions of the system. If you want to share this with other drum machine enthusiasts, please link to this page so the full story is told. That’s all I ask. MIDI Robert Henrit’s, now here. As this registry grows I will include more information on the systems, famous owners and so forth. I know that the designers appear to still have examples of the machines, but I don’t know the serial number, specification and other status. When booted the Inpulse One gives the ROM version after “INPULSE 1” and before “SONG 1”. So far no 64K machines have been confirmed; the 256K upgrade is easy with 8 socketed 256K x 1 DIPs that remain easily found. The ROM is stored on 8 EPROMs (with a 9th MIDI EPROM) – backing these up would be wise as the EPROMs age. In 2002 Mike Clarke, Technical support of Allen & Heath was assisting me in finding tapes/data – and did find a copy brochure and manual, which Allen & Heath still host on their website. He gave me permission to redistribute tapes for Inpulse One users, so I am trying to find as many as I can. Where available, the table below will have both the sound sample in AIFF form and the data from the tape – the data files for this website are not recorded from the tapes, but have been loaded into my Inpulse One, then resaved as a single set of data. At the moment these are large AIFF files – if smaller formats preserve the data’s ability to load over the tape interface they’ll be used in future. Download as a set of data to load from tape. *note: The Factory Hi-Hat sample seems to contain both Open and Closed variants. Samples cannot be loaded into the switched position selected by open/closed on the front panel or via footswitch, and if the Hi-Hat sample is copied from one pad to another, the Open/Closed switch works on all pads. It may be theoretically possible to create new samples that work in the same way. I may have transposed the two cymbals. Tape Loading is fun, and involves a lot of tweaking of levels to get it right. If you can find one in good order, an old home computer tape recorder with a speaker that works during playback even when an earphone lead is connected will make all the difference. Tape One – 9 Percussion Sounds, supplied with Inpulse One originally. Tape One is MISSING – if you find a copy of it or the samples from it, please get in touch. Complete Tape Zipfile – with samples and data. Tape Six is MISSING – if you find a copy of it or the samples from it, please get in touch. Tape Seven is MISSING – if you find a copy of it or the samples from it, please get in touch. Tape Eight is MISSING – if you find a copy of it or the samples from it, please get in touch. Tape Nine is MISSING – if you find a copy of it or the samples from it, please get in touch. Tape Ten and Ten A are MISSING – if you find a copy of it or the samples from it, please get in touch. Tape Eleven is MISSING – if you find a copy of it or the samples from it, please get in touch. To the best of my knowledge, there are no custom chips in the system. Replacement ROMs could be available through AHB; if they are, or they give me permission to dump the ROMs in my own system, I will provide images and details here of how to blow your own to avoid bit-rot. That white battery almost directly in the centre is apparently the cause of death for many Inpulse Ones, btw – I intend to have mine replaced ASAP as a preventative measure. The Inpulse One is built like a tank, so the soldered battery is not really drama. Here are the batteries of 1045 and 1058 respectively… and this is several years ago. Unplug the Inpulse One. The PSU electronics are exposed, so it’s not just for protection of the machine. Undo the four screws on the side of the control panel. Lift the panel to one side, the earth cable on the left (machine facing you) limits movement so be careful. Undo the six screws on the side of the drum pad panel and depending on the state of your machine, either the three screws on the top or the three screws under the shield at the back, near the output ports. The image below shows why you want to lift the output board AND the top panel together, even though the three black screws are partially obscured. This is the output board in place, with four ribbons linking the pad boards to the output board and the earth wire linking it to the chassis. These ribbons are also on the least reinforced areas on the machine. Also, see that capacitor? Don’t touch the contacts. Seriously. If you have undone the three visible screws on the top, be very careful, slide the panel towards you just enough to reach the three black screws securing the output board. Slide it back, and refit the three screws securing the output panel to the drum pad panel. The top panel is now attached to the drum machine by one earth wire and two ribbon cables. The ribbon cables can be detached by pushing the two clips outwards – they may be stiff, but be cautious and steady. The pins will lift straight out if you do this correctly. I usually disconnect the ribbon cable at the output board in both cases. Whilst in there, check the condition of the pins on the connectors – 1058’s were badly corroded. Now remove the MIDI board. Two screws go through plastic standoffs, then a small locknut secures it on the lower right corner. Unto the ribbon cable from the port on the PCB, noting orientation if it’s not already marked, detach the ports (they should be labelled In and Out) and take it away. Remove the short plastic standoff from the stud as it gets in the way of detaching the ribbon cables, but don’t forget to refit it. Now you have the MIDI PCB out of the way you can detach the power cable – mine has a bent pin that looks like a factory mod to disconnect part of the board or avoid issues with an unused pin. Orientation is VERY important on this! Detach the two ribbon cables from the computer board linking it to the DMX board – the larger one can be very stiff. Finally, remove the black screws securing the computer PCB to the chassis. The battery is a commonly available 3.6V Mempack, for which Varta and others make direct replacements. It’s easy to solder as the board is straightforward, and unless you’re incredibly unlucky leakage won’t have hurt the machine, and any damage in that area can be repaired. Reassembly is the reverse, with the caveat that you need to watch those ribbon cables, and remember to put the screws through the MIDI board and slide the longer 2 standoffs on before refitting. I take pictures at every stage. Entire front panel flashing, refusing to boot: Poor connections to power, battery coming up to operating charge, and 100mA 20mm Fuse on Power Supply PCB. Drums not working, but everything else looks good: -5V fuse (400mA 20mm, on rear of machine) blown. Patterns not programmable: Refer to the manual – after erratic junk gets into the memory, it can play up – delete patterns. You can only step-sequence a pattern of 4 bars or less. Unusual pitch behaviour: This should not happen, but the corrupt memory as the battery fails can also cause MIDI mapping issues and similar. Press HOLD and 0, then tap a pad – the key range assigned will be displayed. Press “RES” to reset, then press FROM – on your MIDI keyboard/controller, press the key you want to start a range from. Then press TO on the front panel, and the corresponding end of range note on the MIDI controller. Pressing Pat and the two pitch keys will enable pitch changes from MIDI. It’s a bit odd, but kinda works. Simplicity Itself. The step-time pattern arranger on the Inpulse One offers a degree of user-friendliness I have yet to encounter in any other bit of 80s equipment. If you know of an Inpulse One, own one yourself, or have tapes, advertising material, reviews or other material relating to it, drop me an email on this form.